I don’t know about you, but after staring at a computer monitor for hours, I usually realize I need a break. Of course, like many people, I totally ignore that — and the eye fatigue that follows — and plow onward, only to find myself complaining about my eyes or head mysteriously aching. Go figure. Did you know that people don’t blink as often as they should when they’re in front of a computer? Or that the “tech caves” that devs, programmers and others seem to love — with low lights and bright screens — can really do a job on those eyeballs? After years of ignoring the warnings, I can attest that my eyesight has gotten worse. Sometimes I look away from my display, and notice that my focus doesn’t automatically adjust. It’s like my vision is locked, and a conscious effort has to be made to get my eyes to focus, which is both weird and kind of horrifying. And thanks to something called Computer Vision Syndrome — a condition that affects 50 to 90 percent of computer workers — it’s not all that uncommon. 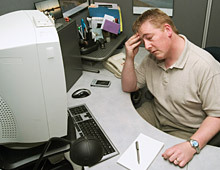 In addition to the blurred vision, discomfort and even eye twitching, some people also notice physical fatigue, as well as decreased productivity and increased frequency of errors. Fer goodness’ sake, blink! : It’s how we lubricate our eyeballs, so when we don’t blink enough — which is the tendency for most of us when we’re in front of a screen — it can do a real number on our ocular health. So remember to blink. You may also want to keep some eyedrops around, to freshen and wake up tired peepers. Check your display settings: Chained to your machine or device for lengthy periods? Then make sure to adjust the brightness and contrast of your screen. Try a “white check”: Take a look at this TechnoBuffalo page — is the white background so bright it could be a light source? Or is it dull and kind of grayish? You want to match the white to match the natural whites of your actual surroundings, not sit in some funky glow of a tech spotlight for hours or days on end. Don’t forget to consider your fonts: A fluorescent green on a busy background might be fun, but nothing beats plain dark text on a light, plain background. Also think about size: Are you squinting a lot? Do you lean in to peer whenever there’s verbiage? Fonts should be three times the size of the smallest text legible from your normal viewing position. More on fonts: Did you know that Verdana was designed for computers, specifically for readability at small sizes onscreen? On the computer, a switch to at least 12-point Verdana could thrill those eyeballs. Tweak your office/desk lighting: In my old office, I had to sweet talk the janitor into getting his ladder and pulling out the fluorescent tube bulb directly over my desk. And then I brought him cookies every day for a month to thank him, because that one move made a huge difference to my work life. So beware the overhead fluorescent light. If things are too dark once you take that sucker out, bring in a floor lamp with an incandescent bulb or even a halogen fixture. The key is to provide a decent source of indirect lighting. Likewise, if you use a desk lamp — don’t point it toward you or your screen. You want nice, indirect ambient lighting. Take breaks: Some advise using the “20-20-20” rule. i.e. every 20 minutes, take a break for 20 seconds and look at stuff that’s 20 feet away. But who can remember to do that on a regular basis? If you tend to get lost in your games, spreadsheets or blog posts, then you may want to set alarms or use third-party software to remind you. Computer glasses? : Whether you already wear glasses, contacts or not, a prescription for computer glasses can do a world of good, especially if you have vision issues from computer use. Not only can they reduce eye strain and help with glare, but they’re available in so many styles, you don’t necessarily have to look like a dork wearing them. Laptops and computer monitors aren’t the only source of eye strain these days. As more people adopt smartphones, those mobile screens add to the (literal) headache. It’s not hard to imagine why: People tend to hold them closer than they would a newspaper or books for purposes like texting, reading and web surfing. This distance — from 14 inches, even as close as 7 inches — is shorter than the 16 inches typically used for reading printed material. It gets worse if you throw stereoscopic 3D into the mix, as smartphones, televisions and other devices are beginning to do. The eye has a really hard time focusing on both the set distance of your device and the varying depth of virtual objects at the same time, says a Journal of Vision study. Called “vergence-accommodation,” the problem doesn’t seem to be huge in the near term, but will likely get worse with prolonged viewing, leading to — you guessed it — visual fatigue, discomfort, blurriness and headaches. Interestingly, the study was partially funded by Samsung, which is one of the biggest makers of 3D televisions today. On one hand, good on them for allowing these results to be published, despite the potential harm to their business. On the other hand, a case could be made that they’re making electronics that, when used as directed, could potentially bug people’s eyes out. Not that I’m hating on Samsung or any other manufacturer. It’s up to every consumer to be responsible for their own usage and behavior around their tech. Of course, no one is suggesting that you trade in that EVO 3D or Optimus 3D for a Jitterbug, or get a pair of 2D glasses (that take the “third dimension” right out of your viewing). or something. But the wise thing to do is not over-indulge regularly for extended periods. Remember to take breaks and maybe keep your device a little further away from your eyes. (It will also help if you boost those fonts wherever you can, or zoom in to read text.) 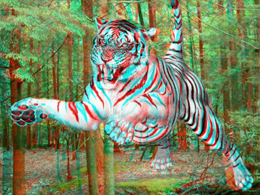 As for 3D, well that’s something you’ll want to use judiciously. 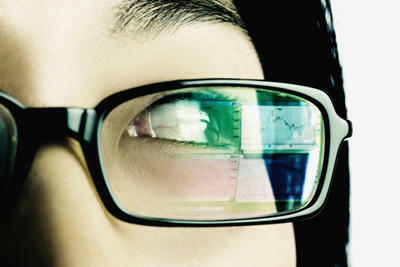 Do you suffer from any tech-related vision problems? Or do you take steps to keep them at bay? Share your story or advice in the comments below.